The economist has called for structural reforms. The Executive Director of the International Blazer Foundation, Oleh Ustenko, has said that Ukraine should fulfill the requirements of the IMF on structural reforms. Speaking at a roundtable conference in Gorshenin Institute on 16 February, Ustenko stressed that sufficient economic growth cannot be ensured without structural reforms. "Ukraine has to show the economic growth of 5 per cent per year to avoid sliding into gradual degradation. There is no reason to be overjoyed about the [last year's] fourth quarter indicators because the overall growth in 2016 will still be in the area of 2 per cent. And don't forget a 17.5-per-cent cumulative fall in 2014-2015," he said. 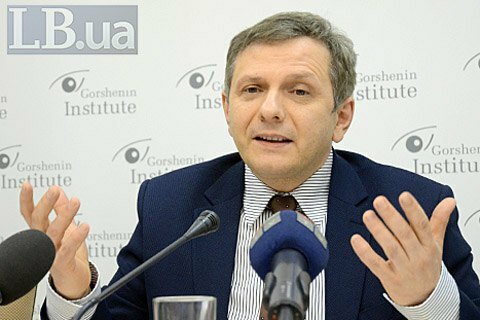 In Ustenko's opinion, Ukrainian politicians should seize on the idea of structural reforms. "Structural reforms give politicians a chance to win back the points they lose when they embark on unpopular measures aimed at fiscal consolidation, like the floating rate of the national currency. Instead, they should grab the chance to put the country on the path of sustainable growth and give people a chance to feel the positive effect of reforms," said Ustenko. The expert suggested that structural reforms are being blocked by those who are involved in corruption schemes.